From the album “Eight Views of Yoshiwara” In an ironic reference to the “Eight Views of Ōmi” on Lake Biwa near Kyōto, a literary theme of Chinese origin that is widespread in art, this print shows scenes from the brothel district of Yoshiwara. Instead of the “evening bell at the Mii Temple”, the much-praised sound of which awakened desire on the part of lovers, here a tin bowl is used. Poem: (The girl) puts the pretty face flower (iris) in the vase – thus make yourself up for the evening. All eight brothel scenes of this album are parodies (mitate-e) of the famous eight views of Lake Biwa. In 1500 Konoe Masaie and his son Hisamichi sang the praises of the individual natural beauties of this lake, which lies to the east of Kyoto. Their poems were copies, modeled after the Chinese eight natural beauties of Lake Dongting where the rivers Xiao and Xiang flow together. This had become widely known in Japan through several pictures by famous painters of the Song Period (960-1279). The Chinese themes were taken up in painting from the 14th c. and the Japanese Lake Biwa from the late 17th c.
The scene depicted here is a parody of the poem „Evening chimes of the Mii Temple.” The lead pots – there is no doubt as to the crude allusion of these utensils – replace the bells of the venerable old temple; its chimes in the original poem fill the lover with longing. Three courtesans are busily occupied with preparations fort he evening: one leans over a washing-bowl and colours her lips, as was fashionable. Seated at an angle to a veiled mirror, another one shaves her colleague’s forehead. A maid brings a vase in the form of a slender wooden tub, from which a bunch of irises protrudes. On reading the poem, the name of the flower adds a further lyrical dimension. The melancholy of the lines lends special fascination to the leaf, which is distinguished by its high artistic quality. The transitory splendour of the flower set, as it were, against the lively activity of the charming young girls is the only hint of warning. The main intention, however, is to impress upon the viewers the attractions of the brothel district Yoshiwara. 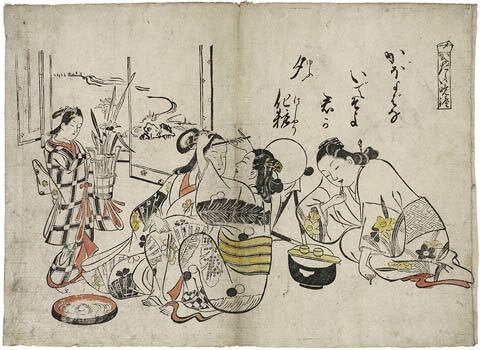 The flower patterns on the robes – narcissi, splayed leaves of banana plant, cherry blossoms between black and white fans – and the iris in the wooden tub, are symbols of spring. But they also serve as important elements of the dynamic composition. The wide belt and the bent narcissus and banana leaves, together with the contours of the clothing and hairstyles, direct the eye in a grand sweep from the right towards the centre of the picture, and then on in dynamic curves by way of a river bed painted on a folding screen, out of the picture to the rear. This movement lends the image a sense of hurried activity which pervades the atmosphere of the scene.